7-Night Classic Alaska Itinerary Sailing Roundtrip Seattle! Alaska is every bit as spectacular as you've heard. Magnificent glaciers, wildlife and history. Visit Ketchikan, surrounded by some of the world's most lush wilderness, and Juneau with its unparalleled glacier viewing. Venture to Icy Straight Point where the wildlife outnumbers the human population. Next up: a fun stop in the quaint town of Victoria, British Columbia known for its stunning Butchart Gardens. Plus, you can satisfy your sense of adventure and taste for luxury aboard one of Norwegian Cruise Line's newest ships, Norwegian Joy. Norwegian Joy is the sister ship to Norwegian Bliss and starts sailing in April 2019. Enjoy innovations onboard such as a two-story race track, Galaxy Pavilion virtual world, and their new spacious luxury concierge suites. Great Price for Brand-New Ship in Alaska! If you have previously worked with a Skyscraper Tours agent, please specify who here. Go for the checkered flag on a thrilling two-level race track in the middle of the ocean – the first ever at sea. Whether you’re racing through exhilarating turns or simply relaxing on the top deck, cruising with Norwegian means vacationing at your own speed. Step inside the Galaxy Pavilion and into a virtual world unlike anything you’ve ever seen. Immersive virtual reality experiences. Thrilling simulator rides. Interactive video walls. This is just the beginning of an exciting new world to discover. With plenty of room to relax, our beautifully appointed, luxury Concierge suites offer some of the grandest accommodations on board. Feel pampered with 24/7 concierge service, available to help with everything from booking shore excursions to arranging customized experiences. Private dining, priority embarkation and disembarkation, and special perks round out the exclusive experience in these spacious suites. 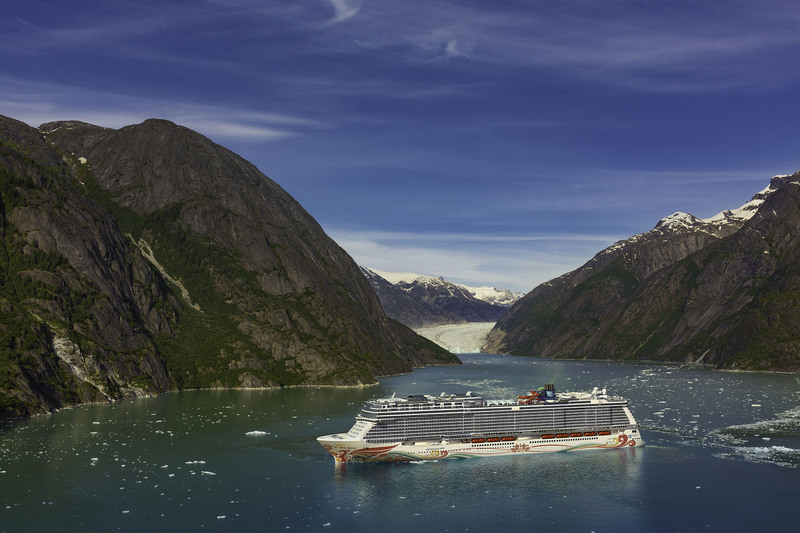 The best way to cruise Alaska just got better as Norwegian Joy joins her sister ship Norwegian Bliss starting April 2019. Find your happy place on board Norwegian Joy when she cruises year-round from the west coast to Alaska, the Mexican Riviera, and Panama Canal from Miami and Los Angeles. Enjoy a rush like no other as you race in the middle of the ocean on a thrilling two–level race track. Immerse yourself in all the wonder of a virtual world in the Galaxy Pavilion. Be pampered in luxury in our new, spacious and beautifully appointed Concierge accommodations. Explore the wilds of Alaska including pods of whales up close in untouched Icy Strait Point. Enjoy vacation experiences that will delight your senses and calm your soul on Norwegian Joy. Prices are per person based on double occupancy, availability and subject to change without notice. Free at Sea choice(s) must be selected at least 24 hours prior to sailing and cannot be changed on board. Bookings made within 24 hours to departure can choose promotion at time of booking. Guest cannot substitute or customize this offer. All guests in stateroom must choose same offer. Government taxes, port expenses & fees, discretionary onboard service charges and/or gratuities are additional. Cancellation Fees also apply based on the booking/sailing date; therefore, Norwegian Cruise Line strongly recommends the purchase of travel protection on all bookings. This is a cruise only offer. This promotion is not applicable on the land portion of Cruisetours or bundles. No components included in this offer have any monetary value, are non-refundable and non-transferable. Offer and combinability with other promotional offers is subject to change at any time per Norwegian Cruise Line's discretion. Other restrictions may apply. Norwegian Cruise Line reserves the right to cancel or withdraw this offer at any time. Free or Reduced Airfare: Reservation must be made more than 16 days prior to sailing to qualify. Air offer applies to economy, round-trip flights from select departure gateways only and will automatically apply. Offer only valid on select sailings. Air gateways are capacity controlled and subject to availability. Select sail dates may have gateways that are not eligible for the air offer. Blackout sail dates are at the discretion of Norwegian Cruise Line. 3rd-4th guests will receive 25% off Norwegian Cruise Line's regular air/sea rates. Guests may not deviate air when selecting the free or reduced air option, except Pride of America sailings. Guests booked on Pride of America sailings may request to deviate air up to 2 days pre/post cruise. A deviation fee of $50 USD per person will be charged on Pride of America sailings. Norwegian Cruise Line reserves the right to choose the air carrier, routing and city airport from each gateway city and reserves the right to substitute commuter service and/or charter air service for scheduled air carriers without prior notice. Upgraded class of service is permitted at an additional charge.